Your nose has a significant impact on your appearance. It’s said that the nose anchors the other features of the face. Many people aren’t necessarily thrilled with the nose Mother Nature bestowed upon them. Also, our nose changes as we age; it can start to droop slightly or lose volume just like the rest of our face. Rhinoplasty is not only very costly but a surgical procedure that carries risks. After the fact, incisions and bruising must heal, and there’s the possibility of scarring; not to mention the amount of time required for recovery. There’s also the possibility that you’re still unhappy with your nose after going under the knife (possibly even more unhappy than you were to begin with). Now, thanks to the latest technology in facial aesthetics, the shape of the nose can be changed through minimally invasive techniques. Our nurse practitioner Ashley Pontenberg uses PDO threads to lift and subtly shape the nose, improving the look of lost volume, scarring, or drooping that happens with age. PDO threads can visibly alter the shape and projection of the nose. PDO stands for polydioxanone and is a material used by surgeons for surgical sutures. The threads are bio-compatible and are absorbed by the body over time. They’re placed under the skin and used to elevate the bridge and tip of the nose. Lifting the nose with PDO threads can even help improve breathing. Hyaluronic acid fillers can also be precisely injected to enhance the shape of the nose, correcting bumps, scars, and asymmetry. Hyaluronic acid (HA) is a sugary, gel-like substance that occurs naturally throughout our skin’s structure and connective tissue. It lubricates joints and keeps things moist. When injected under the skin, it fills out lines, plumps lips and can enhance contours like the cheeks. The nice thing about HA fillers is that they are reversible should you ever be unhappy with the outcome. Injecting a special enzyme causes the filler to dissolve within 24 hours. Ashley will sometimes use a combination of both threads and filler to change the contour of the nose. PDO threads and HA fillers are both in-office procedures that can be performed in under a half hour, requiring little to no downtime to recover. Filler can last up to a year or longer, and unlike surgery, should you not like your result it’s not permanent. With touch-ups, PDO threads can make a lasting change to your nose. The threads themselves are broken down about 6 to 8 months after the treatment, but they stimulate collagen formation to provide sustainable lift over time. Can these nose treatments have side effects? Some mild swelling or redness at the injection sites is normal, and a bit of bruising may occur. These side effects resolve within a few days. 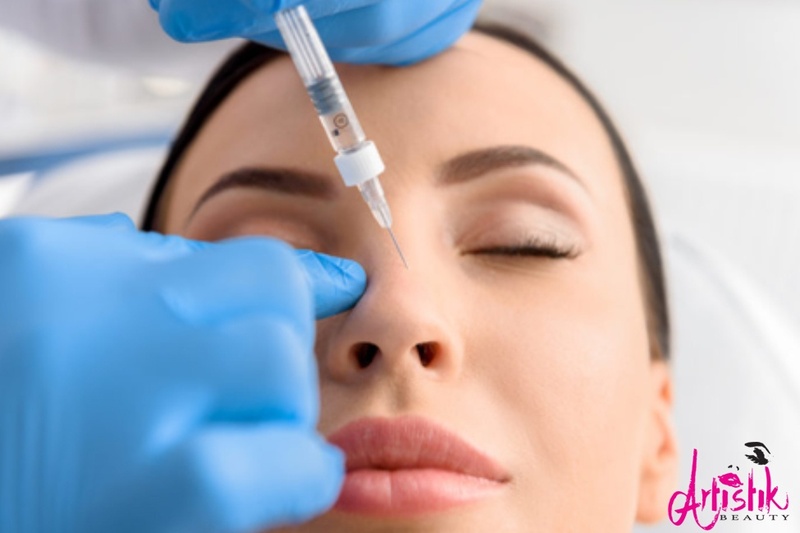 Nose filler must be performed by an experienced injector who is aware of the possibility of infection and vascular complications that come with filling this area. If not handled by someone competent, filling the nose can lead to skin necrosis or even blindness. While these complications are rare, they emphasize the importance of seeing a highly qualified and trustworthy injector like our nurse practitioner Ashley Pontenberg. A non-surgical nose treatment is also an excellent first step should you think you might want rhinoplasty one day. It gives you the chance to “try out” a new and improved nose without the commitment, risk, or expense of surgery. Call, email, or text Artistik Beauty to find out if you’re a candidate for a non-surgical nose job today!